The safety standard that applies to multimeter is the IEC 1010. When you see CAT rating of a multimeter, that CAT rating refers to IEC1010 Installation Category. That Installation Category defines the environment where the meter can be safely used. Most hobbyist would require meter with a CAT I or CAT II rating. CAT I would be for things like electronics circuit powered by battery or plug pack. CAT II would be things like appliances connected to wall outlet. For more information about the standard, see this overview by NI. The sad fact is that many (cheap) meters lies about their IEC1010 compliance. Internal inspection of those meter clearly shows that those meters have not been build with safety in mind. A safe meter would have correctly specified protection devices such as fuses (ceramic instead of glass fuse are often used for the high interrupt rating capacity), MOVs (the more of them, the bigger the better), PTC, and appropriately sized air clearance and creepage distance. Unsafe meter is dangerous. See this video for demonstration of unsafe meter. The Fluke 17B claims CAT II 600V rating. (Manual claims CAT III 300V, but only have CAT II 600V printed on the body). However the supplied probe is only CAT I rated (Not the standard Fluke TL75 probe) . The 17B cannot be used in CAT II areas without replacing the probe. Is the 17B compliance real? Unlike other Fluke models, the 17B does not have Underwriters Laboratory recognition. The manual claims that the 17B is certified by CMC. I don’t know who CMC is. Internal inspection of meter suggests that the 17B has been designed to comply with the standard. See part I of my review for internal photos. Build quality is an important aspect of measurement confidence. The 17B build quality is very good. Body is solid. Probes are good. Probe socket makes good solid contact. Function dial is good. Display is good. This may seem trivial, but clear display helps avoid measurement error. The 17B LCD is big and clear. Decimal digit is displayed clearly. Measurement mode and unit are clearly displayed on all setting. I performed accuracy spot check on my meter. All measurements (except for low value capacitance) are well within the accuracy specification. Displays incorrect value just after auto-ranging. The reading overshoot for one sample reading. Measurement are generally fast, however resistance autorange is slow. It takes about three and a half second to measure 100Ohm resistor. Continuity tester is annoying. The meter goes beep, then random duration of silent for a fraction of a second, followed by continous beep. 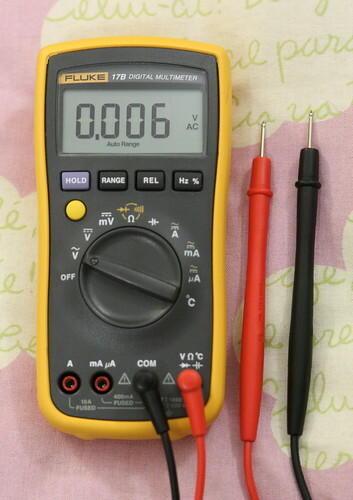 The Fluke 17B is a good basic meter. It’s not good as other Fluke meters but is still a good meter. It is much better than no-name brand meters.